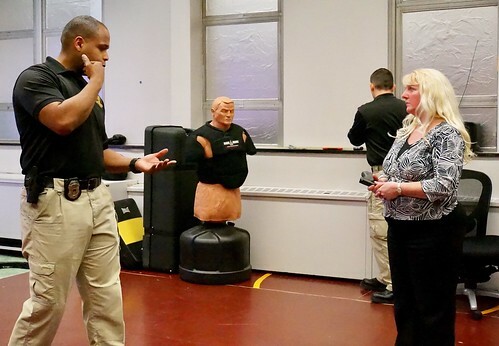 Alumni of the Speedway Police Department’s Citizens Academy program recently participated in a Continuing Education Class, “Use of Force / Shoot-Don’t Shoot,” held at the IMPD Training Academy. 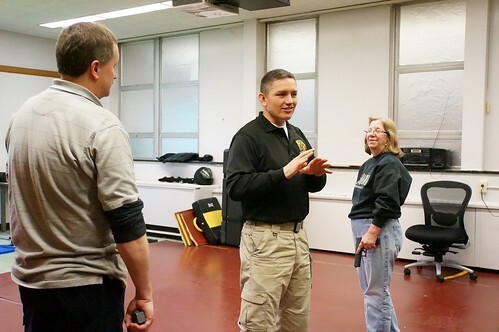 The SPCAAA would like to express their thanks and appreciation to IMPD and specifically, IMPD training instructors Sgt. Nate Barlow and Officer Tony Priami, for their time, use of facilities, and excellent interactive presentation. We’d also like to thank Speedway Police Department Chief Jim Campbell & Assistant Chief Charles Upchurch for arranging the class, and to Sgt. Mirantha Wilson for her time and attendance as well! 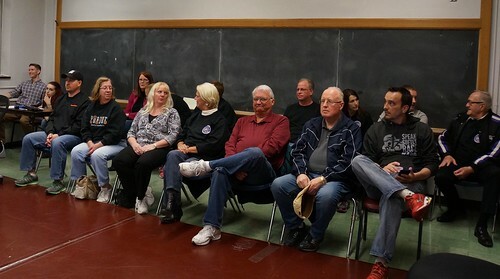 The class was incredibly insightful, tense, and provided an understanding to the stresses of police work. 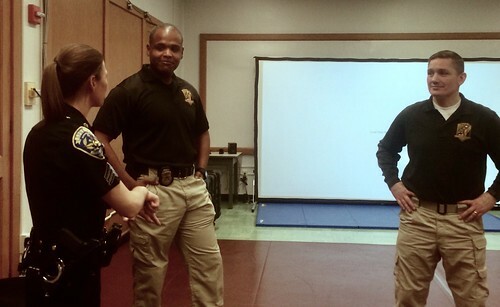 Alumni were first given an introduction into the basics regarding use of force as a part of an officer’s job. Police Officers are subjected to approximately 56,000 random acts of violence against them a year for simply wearing the badge and being an authority figure. Stressful. 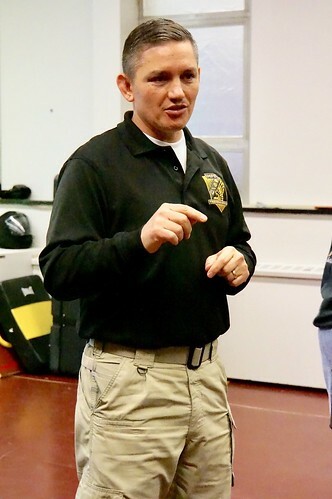 Every time an officer pulls over a vehicle, the officer doesn’t know how things will turn out; will the occupants be calm & responsive, or belligerent, drunk, uncooperative, have drugs, weapons, or run. Any number of things can go wrong on a traffic stop. The two most dangerous incidents for an officer are domestic violence calls and traffic stops. Stressful. It takes 1.4 seconds for the “bad guy” to pull and fire a weapon. It takes the officer 2.5 seconds to process this incident and return fire. Stressful. As students participated in 7 different scenarios, all of which were real life situations, it really gave a better feeling of just how quickly things go from simple to life altering. 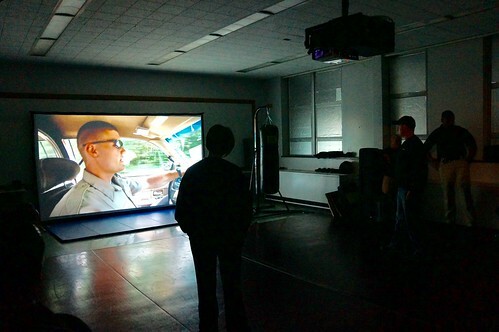 In each interactive scenario, two students worked together as partners watching a video of a suspect. Students were instructe d to move around, speak to the suspect, issue commands, etc. 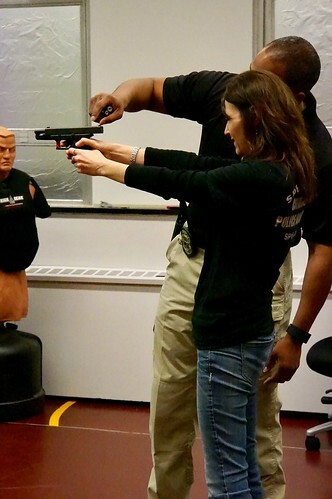 With these actions, the video suspect reacted accordingly, necessitating the students to think and react in response until the “shoot/don’t shoot” moment occurred. In one scenario, they stopped a car for reckless driving. The man appeared intoxicated and would not listen to the “officer’s” command to take his hands out of his pockets. After several attempts to get him to comply, the suspect stated he had a gun and was going to use it. He reached in his waistband, assumed a shooting stance and drew. One of the students instantly raised their gun and shot him: one fatal shot and one non fatal shot. Now for what was happening at the exact time the shot was taken, he brought up 2 fingers and said “bang bang.” An unarmed man was shot. After the events and actions leading up to the shots were weighed, it was determined to be a justified shooting. Thoughts afterward? Yes, it had to be done, but was not a good feeling. In another scenario, students responded as backup to an officer who had pulled over a man wanted on a warrant. The man exited his vehicle and was loudly arguing with the officer, but had not displayed a weapon or used any physical force. Suddenly, a small child exited the passenger’s side of the truck brandishing a shotgun. After several attempts to command the child to put down her weapon, she shot the first officer, after which students reacted and shot. Again, an incredibly difficult and heart wrenching situation, that we cannot even begin to fathom dealing with. But remember, all of the scenarios in the class were real. In reading a story of a police-involved shooting, we can sit back and judge what we think should or could have happened. The effects of an officer doing their job to protect us can change their life and those of their families forever. After having taken the class, students all agreed it would be a valuable opportunity for everyone to do a shoot / don’t shoot scenario. Our greatest lesson learned was police officers don’t do this job hoping to pull their weapon, they do it so you can feel safe and can go home to your family. They are mothers, fathers, moms, dads, brothers, sisters, friends, loved ones…they are just like you and me, they want to go home to their families too. As we go about our daily lives, and those times we see Military persons on the street and we thank them for their service, remember the Police Officers we see every day as well, and thank them too. To them all, thank you for your commitment, your sacrifices, your families, and being you. Thank You!